Home > Opinions > Entertainment > Should T-series overcome Pewdiepie and take the number 1 slot on YouTube? 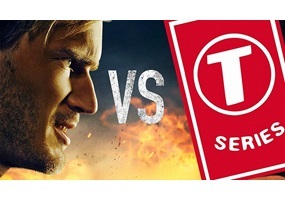 Should T-series overcome Pewdiepie and take the number 1 slot on YouTube? Is Breaking Bad the best television drama of all time? Azealia Banks files a police report against Russell Crowe after a hotel fight. Will Crowe get arrested? Do you think famous people are better than you? New Year 2017: Should everyone wear 2017 glasses on New Year's Eve? Did beloved silent film star Charlie Chaplin father a secret "love child" with a '20s starlet??? Carrie Fisher's daughter Billie Lourd mourns the deaths of her mother and grandmother. Does tragedy generally make people stronger? Should Video Game developers make more female protagonists? it is illegal to film in Devetashka Cave ever since the Expendables 2 film caused the death/relocation of nearly 25,000 bats: Should there be legal ramifications for the filmmakers of Expendables 2? Does 'Argo' deserve the Oscar for best picture? Should entertainers make changes to programming after the Newtown shootings?